The BFI London Film Festival is an incredible excitement-inducing highlight in my calendar. This year marks its 56th run and appallingly I’ve only been attending the past four. A pity. Had I discovered it sooner, I may have been privy to many more (yet to be seen) motion treasures that seem to join a personal film-purgatory; a mystical list of films that I quite often hear about and am encouraged to watch, but never have the time and often capability to. Based on this continual outcome, I am gathering a list to watch in my retirement (whenever that may occur) and look forward immensely to amusing and exciting my future self with hours of visual pleasure. I adore being immersed in the atmosphere of it all, following in fellow passionistas into dimly lit venues spread out across the City, initiating me to some theatres that I have never been to before. I settle into my chair excitedly, knowing that the (majority) of people attending will be equally respectful to the screening, looking to be absorbed by the film, ensuring chatter and popcorn crunching is saved for the films on general release. Most importantly of all, the Director is also usually present and will discuss their vision and reasoning for the production of the film as well as a questions/answers session. The artist themself describing their work, what a privilege ! Compared to previous years, I had decided to throw myself with gusto into this years offerings. Ever since I read (with envy) of Jim Broadbent taking 2 weeks off to attend as many screenings as possible, I pondered following suit, although with less dedication (holiday time is never in profuse amounts in the workplace so one must plan a little more strategically). And so I booked to watch 10 films. Over a period of 9 days. All of the films I watched solo (except for opening night as it was a much lighter screening, better enjoyed in company) liberating me from checking whether potential companions were as enthused as I or even available to accompany me. Cinema-going has many of its own idiosyncrasies and over time I have found attending alone much more satisfying. It is, in itself, an anti-social activity as you are incommunicado, gazing in awe and silence (I would hope) at the huge moving image in front of your eyes. Ever since I was a child, this was Art brought to life for me. All the things in life that my parents daren’t talk to me about, I gained through the free education of film. Often whilst listening to my music when walking about my day, it feels like a soundtrack, adding an accompanying symphony to the most mundane of activities. And equally too, soundtracks from films have also educated my musical tastes. I owe much to the the world of motion picture. It has been a constant source of creativity, comfort and enlightenment over many years which is why I was so excited to dedicate myself to the experience over the two weeks. I have no professional film education so I went into these screenings as a layman but my views and opinions come from the heart and if you do get to see any of these at a later date, I hope these reviews provide a pleasant alternative perspective. Not since The Nightmare Before Christmas have I quite enjoyed many other animated films (except for Wes Anderson’s Fantastic Mr Fox perhaps). Nothing wrong with it, I just prefer flesh & blood more (call me old-fashioned). However with opening night, this was to be an exception and particularly as the director is Tim Burton. I am very fond of Tim’s offerings, some might comment that he is consistently consistent in his eerie, macabre presentation of film and cartoon however that’s what I enjoy most about him. He is creepy and he IS kooky so I know I’m getting what I paid for! 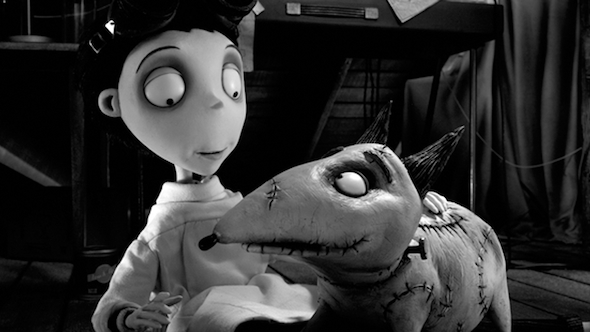 Frankenweenie is an endearing homage to (of course) Frankenstein with young lad Victor playing the Dr and his beloved dog Sparky as the misunderstood beast. The fictional town of New Holland is occupied by various docile inhabitants and the new local teacher inspires the pale students with a science project. Victor goes on to use these new-found tricks in bringing his own project to life and without sounding predictable, you can imagine how the rest of the story goes. But I thoroughly enjoyed it. Little attention to details made me grin (such as in the Pet Cemetery a gravestone for ‘Goodbye Kitty’ in place of the usual symbol of popular culture). A delight and something to smile about. Well done Tim. South East Asia seems to produce a wonderfully candid view of human life. Often, the plotlines and rhythm of each are so stark and realistic which is what I like most about them. Western films (well, perhaps more so the highly publicised ones) are so well-groomed, the grim reality of humanity is often made more presentable to the audience so as (possibly) not to incite copy-cat killings. So with The Samurai The Night I was secretly hoping for a blood-bath. How wrong I could be. It was quite a gentle film in the end, with the premise centering around the hit-and-run death of Hisako, the wife of Ken. A simple afternoon with 2 reprobates driving through some desolate streets leads to a 5 year countdown to (potential) showdown between the bereaved and the murderer. You want to feel sympathy for the widower clinging to the single, quite annoying answer-phone message from his wife whilst holding her unwashed garments, but its more a mixture of aghast shame and indifference. What I found most interesting is the continual attention Aoki (the dead wife’s brother) gives Ken, all because he just wants to see him happy again. Aoki has a wife and children of his own and it was his own sister that died however he is driven by providing a potential suitor for Ken as well as deflecting the unwanted squealing to the police by the key perpetrator Kijama who is an appalling example of human life. The men in the film are all conflicted; the women are all non-threatening and at times submissive. Its an interesting and quite simple observation of the aftermath of a bereavement. The simplicity of the little relationships from the unbelievably servile Mr Kobayashi to the conflicted loyalty of Hoshi add more humane elements to an emotionally wrought film. An interesting premise and entertaining indeed, but one thing viewers will leave with for certain will be a repulsion for custard-pots. 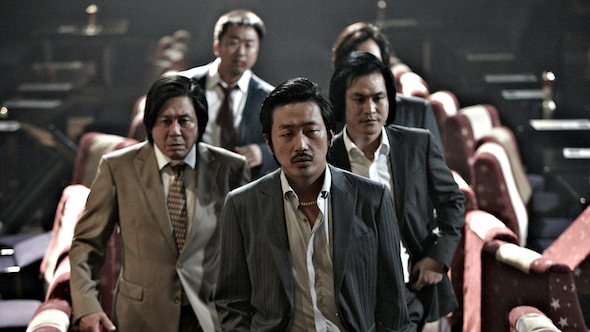 South Korea and an homage to the gangster crackdown of the Nineties, this film feeds into the slightly mainstream (but always popular) cigarette flicking, suited-strut of the oh-so-cool screen Mafioso. This time its Korean and its an interesting story in the sense it is more about a gangster that stumbles into this line of work rather than actively seeking it out. Main character Choi Ik-hyun is the same actor from the infamous Old Boy however this film is distinctly less dark and could easily be remade in the US. Choi is a foolish fellow, muddling through life with inebriated humour and soaking up as many underhand dealings (without the danger) as much as possible. 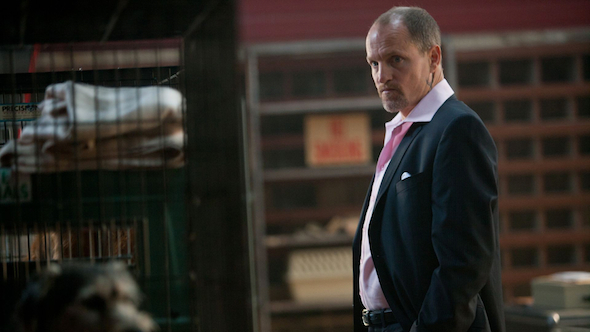 A discovery of heroin one night triggers the option of big money, and through the union of a local gang leader, he begins his descent into gang life. It is frequently hindered by his stupidity and delusions of grandeur so there are moments of frustration when watching but this only lends itself to good acting. On the whole, it is a ‘crowd-pleasing’ film which is why I can understand its highest grossing ever status in Korea, however there could have been more exploration into the traditional, more psychologically traumatic genre that I have found in-keeping with Asiatic cinema. Fun to watch and the action is quite frequent so it will keep your eyes active. Much like 4 months, 3 weeks and 2 days I was expecting an intense interpretation of human suffering (usually of the female kind) as well as ethics and morality being thrown into the pot too. I was not disappointed. 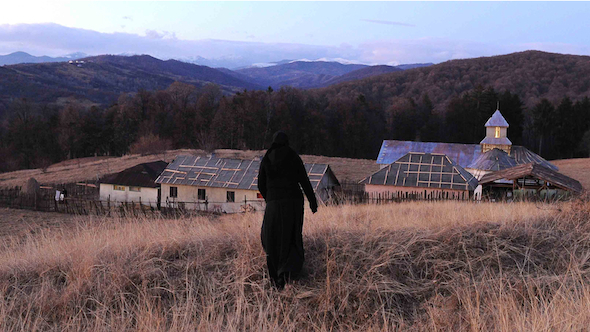 Beyond the Hills centres around the relationship and conflicting desires of Voichita and Alina, childhood friends (although questionably more intimate than just friends) from the same orphanage who are reunited at Voichita’s Orthodox Convent in a desolate Romanian town, with religion being the subject of much contempt for Alina. Alina is very afflicted; she craves Voichita to be by her side constantly and although Voichita has chosen to dedicate herself to God and has offered redemption by joining in the convent’s daily grind, Alina despises the place, in particular the main male figure of the priest, acting out in an extremely violent and a spoilt manner because her friend now has a different focus. Its not an easy film to watch, although it interests me to wonder how an athiest or one with no religious background could interpret the movie. In the first half, there is a lot of hope at the convent. Although there are deepset traditions and very conservative opinions shared within the community, the mutual love and concern to help others makes you feel hopeful for a place of healing for Alina. There is no such outcome in the 2nd half though, with things getting much more harrowing, the dilemma between what is humane/good versus what is morally wrong/unacceptable poises in your mind as you witness Alina’s tactics to retain her friend and the church’s uncertain approach to the maddening behaviour. The director spoke at the end and his view is not to judge on religion or lifestyle, it is simply to provoke questions and provide a film that gives an insight into a relatively hidden world. One to cast your own opinion on. My lightest and most interesting watch so far, this is a film about story-telling and imagination, using a dark humour akin to the Director’s usual style (previously attributed to Potiche). Germain is a frustrated teacher, disillusioned with the writing abilities of his students until Claude hands in his paper on his past weekend’s activities. Claude describes his introduction to the family in the home of his new school friend, the affable but not particularly intelligible Rapha Jnr. It is a voyeuristic experience where he details the scent of the middle-class mother and the enviable perceived perfection of a close-knit family. The story becomes bait for Germain with the ending line of ‘To be Continued’. It leads to an almost obsessive real life page-turner, with Germain’s wife Jeanne (played perfectly by Kristin Scott Thomas) being drawn into the ‘What next’ questions throughout the film. Claude himself is quite manipulative for someone so young and he one-handedly manages to unbalance the worlds of both his teacher and school friend through his incessant curiosity and desire for a world that he wants to belong to. He is smitten with Rapha’s bored housewife mother Esther yet he also wants the recognition and bond of the father Rapha Snr. It is an interesting story and can be easily interpreted as Woody Allen-esque with its witty, comedic observations and plotlines. There are even elements of Hitchcock’s Rear Window which seems a little unintentional by the director (as he stated at the end) however it retains its individuality by being based in France and a more European sense of humour. Lines are crossed and relationships are unsettled by actions made by both Claude and Germain, which leads to a climatic and open ending. Thoroughly enjoyable script and bound to be applauded by many, it is a wonderful story of the human need for connection as well as its darker, more unnecessary attraction to the lives of others rather than one’s own. As I set out to watch this film on a relatively calm (although late) Monday evening, I was prepared for an enchanting visual and auditory experience. 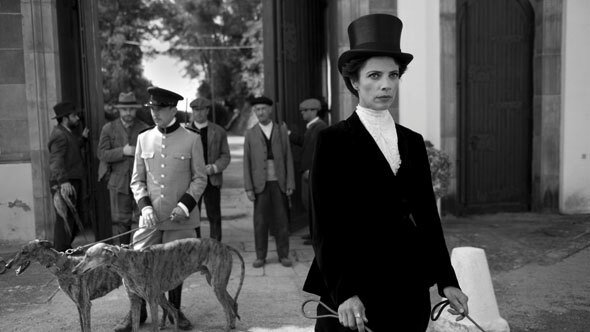 This was to be a ‘silent’ film, an homage to 1920s Spain and a re-telling of the Snow-White story (hence Blancanieves). And I most certainly was. This is not your traditional story-telling but there is much symbolism and references to the magic of childhood fairytales. You are transported to the time of black-and-white with only an orchestra and incredible score to guide you through the journey. Your eyes are witness to joy, beauty, tragedy, sadness, strife, vanity, envy, unity and love, in various forms and interpreted by the wonderful characteristics and charm of each and every actor. Carmencita is the daughter of the handsome & brave renowned Matador, Antonio and the beautiful flamenco dancer Carmen, who sadly dies in childbirth at the beginning of the story. The father’s goring by a bull seems to induce the birth which leaves him resentful and indifferent during his recovery, knowing his darling Carmen is no longer by his side. The wicked step-mother manifests as his nurse, managing to weave her way into his life as his carer and eventual wife. The man is broken, his passion for life is gone, in particular because he can no longer practice his art due to loss of sensitivity in his hands and feet. So the stepmother inherits the fortune, keeping the paraplegic in confinement on the forbidden 2nd floor of the mansion. Carmencita is cared for by her Grandmother, but when another tragedy strikes, she is taken to her father’s home although the long-absent patriarch is nowhere to be seen. Instead, the step-mother welcomes her but swiftly puts her to task as another minion, with the worst possible jobs to occupy the unfortunate 8 yr old. Without ruining the story, more tragedy is yet to come but the familiar elements of the fairy-tale are apparent throughout including an delightful turn from the seven dwarves who in this instance are touring bull-fighters. The evolution of Blancanieves (Snow-White) from adoring and persevering daughter to humble and ever-hopeful young woman is a beauty to watch. Of course the majority of the cast are visually pleasing but the main magic comes in the minimal use of words. Your mind is invited to use imagination and the film managed to retain my attention from beginning to end. Every scene was thought out, the cinematography held strong with every picturesque image and makes you want to step into the film to be part of the cast (or to simply dance the flamenco at one or two moments). My heart was truly swept up in the delivery and I was suitably contented to hear the director afterwards speak with true passion of the masterpiece we had just seen on the screen. Pablo himself is a great writer and mentioned how the film itself took almost 8 years to produce and direct due to the fact the script was unspoken. But it was still over 80 pages long. He mentions his method is to write as though the words were to be read to a blind person, so every moment, colour and expression must be detailed so the listener can picture the scene in their mind. I concur and agree with this synopsis. As well as being an homage to European silent film, it is simply wonderfully made and presented. When you watch this film you will ‘see’ what I mean at the end, but it will bring a tear to your eye. Enjoy a future classic. Introduced by the director Jem Cohen, it is both documentary and narrative. This was the most gentle film I had seen so far during the festival and suited its surroundings at the ICA on the Mall, a delightful exhibition space filled with other contemplative souls. People are a key focus in the film, average people, aside from the background of an overcast Vienna. It begins with Anne from Montreal, who boards a plane to visit her comatose cousin in Austria’s capital. 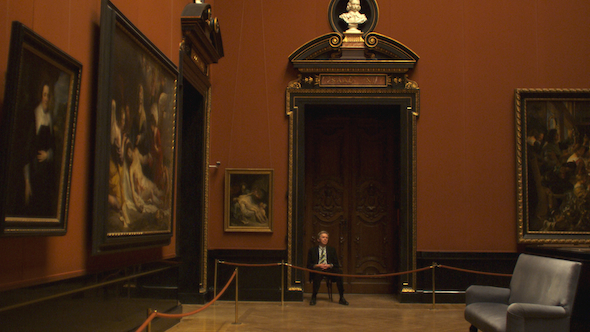 Johann, a calm museum guard in the Museum (where Anne meets him) whose observations of life and local knowledge induce a smirk frequently throughout the film; “often we get asked where the bathrooms are in the building. For the more rude visitors, the guards tend to direct them on the ‘scenic’ tour” are frequent little bursts of humour from Johann, who comes across as rather dry but has a wonderful wit and comfort within his own skin. His comment on previously having had a lot of ‘loud’ in his life to now have a lot of ‘quiet’ in the Museum had a certain resonance with me, particularly as the crowd surrounding me were mostly wiser and better lived than myself. Through a completely platonic friendship, with the cousin acting as the link, Johann leads Anne through some key Viennese observations, walking around buildings and sitting in bars sharing a beer whilst discussing music interests and previous misdemeanour’s. Johann is by no means lonely (he plays too much online poker apparently) whilst Anne is more of a poignant mystery, hesitant to leave until her cousin’s health improves so she has much needed comfort through Johann. The movie drifts along, with many shots and discussions focussing on Bruegel and his ability to paint simple life yet with amazing details, so that you can overlook many aspects and always see something new. The education you receive just by watching the movie is bewildering and what I thought was to be a Tourist Board homage to Vienna was actually much more engaging as it was told through very human eyes. Jem mentioned at the end that his parents frequently dragged him to Museums as a child and for this, he is grateful. Elitism or simply a home for sharing and educating the public with works of art. A subject for debate however in this film, try not to analyse it too much and just enjoy the excellent observational tools it provides for you. 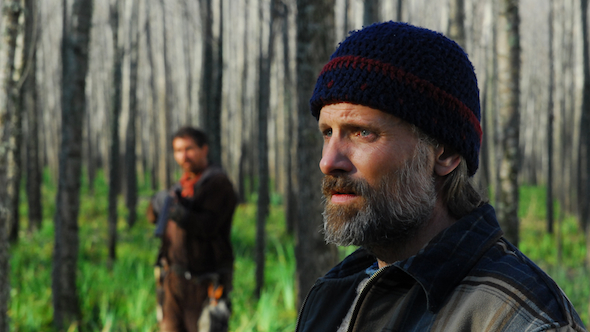 Viggo Mortensen plays twin brothers in this intense thriller about changing the course of your life and the unplanned for events that can occur. Perhaps the title is ironic as the key brother Agustín mentions in the middle of the film that he ‘has no plan’, but I believe him on this one. Initially assigned to a life of potential Fatherhood through the adoption that his wife of 8 years Claudia is so looking forward to, this is not something that Agustín aspires to and his revelation to Claudia early on in the film pains her intensely. As a background story, Pedro, Agustín’s twin who lives in a thieve’s hidden river town earns money as a bee-keeper and mainly drinks a lot, smokes a lot and involves himself with a loathsome character called Adrian, who is a childhood friend of both men. After a dramatic unexplained murder, Pedro disappears to see his brother which comes as a big surprise to Agustín who is in a strange state of denial in his apartment alone. There is a conflict and heavy unease between the brothers, one is fearless whereas the other is despondent. What follows is an exchange of lifestyles, seemingly unplanned for and it is shaped as it comes along. Without ruining the story, I will not go into detail however as usual, Viggo’s acting skills are excellent and he is a tormented soul trying to make changes in his life however there is an almost sociopathic element to him as his actions happen so quickly and with such keen continium, that you question his sanity at times. This is Ana Piterbarg’s first feature film and she came on a the end of the film with her producer. Ana is an extremely dedicated film maker and had she not met Viggo she would probably not have been able to finance the film. I greeted her afterwards to congratulate her on her work and she welcomed me warmly to reciprocate my gratitude. This will be well received I imagine and it was a delight to see a female director producing a strong piece in a male dominated industry. Based on my previous choices, I seemed to continually opt for a more thought-provoking genre of film. Our Children is absolutely no exception in this theme and I was not aware how excruciating it was to be (not in a negative way! When you see it, you will understand my stance). It begins with a classic love story between Mounir and Murielle, young lovers that cling to every last moment on the lips and within each others arms. Mounir quickly proposes to his amour and keenly introduces her to his legal guardian, the doctor André. André provides everything for the couple; he recruits in Mounir to work with him at his practice and his home is their home. Following various pregnancies, children also join the clan in André’s abode but this is where the exuberance of first love starts to strain. Murielle produces Mounir four children and her lack of support in the home ensures her mental decline. 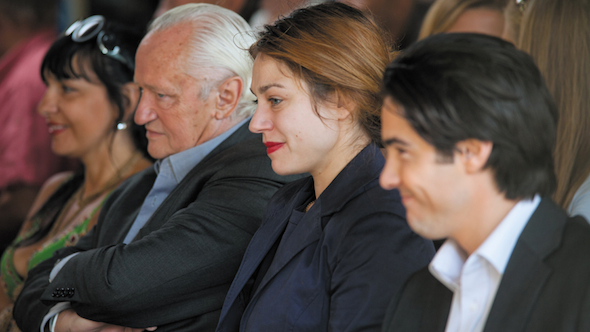 Mounir is busy with his work and rather than seek to find a solution to Murielle’s struggle, he dismisses her frequently, more concerned with losing André’s perception of him and demanding more respect shown (André frequently provides gifts for the couple too, however he is a gift-giver with conditions expecting loyalty from his monetary generosity). There are 2 worlds that cross over but are not destined to meet, with Mounir’s Mother based in Morocco and various siblings seeking out papers for marital redemption from living there (for example Mounir’s obstinate brother marrying Murielle’s crass sister to provide his residency in France). The main focus of the film though is the quite loving but ultimately tragic triangle between the main characters. Mounir loves both André and Murielle, but he is obliged to André in many ways due to his financial support which upsets Murielle and hinders the couple’s plan to possibly relocate to Morocco for a better life due to André’s threatened abandonment. So Murielle sinks deeper into depression with only her children as daily distraction and Mounir begins to feel contempt towards her, chastising her Motherhood skills which are at times questionable but never meant to be harmful. Murielle is trapped under the roof provided by André and various events lead up to a distressing finale which will leave you speechless. Joachim Lafosse was very keen to hear views from the audience at the end, all of which were quite taken by the film. I raised a question too at the end as to whether André had ultimately (although without necessarily realising) orchestrated such an outcome, but I leave you to judge. Many questions came to mind after and I am not sure myself whether they can be answered however it is possibly best left that way. Stirring material for the mind to make you question your own approach. Recommended. I had seen In Bruges by the same director and I was excited to conclude my festival experience with a lighter, perhaps more uplifting film. Colin Farrell joins a very starry cast in Seven Psychopaths including the excellent Sam Rockwell, Woody Harrelson and Christopher Walken. Ultimately the film is very male-heavy, with the story centering around Marty, a struggling screenwriter (sound familiar?) unable to barely begin his script but with the constant inspiration and assistance of his friend Billy. Billy has a friend, an older gentleman called Hans who runs a very harmless kidnapping scheme of dogs, and plays sidekick in poaching the dog before Hans returns it a few days later to claim the reward. A scam that works until they pick up the wrong dog. Bonny the Shih tzu belongs to Charlie who has no qualms about shooting the perpetrator and the viewers are immediately led into a fused story of Marty trying to dream up psychopaths for his script, but with the gratuitous violence provided by various (predictable) events which are resulting outcomes stemming from the doomed choice of dog. Whilst some laughs were gained, I thought it was not particularly well-constructed and based on my prior film choices it lacked a huge amount of substance and quality that I had grown quite used to. An American movie for the general public and will no doubt please many as it does not require much thought process, however, it was indeed a light relief after the previous night’s viewing. I left without a churning mind but it suited this moment and was a nicely simple bow out from the Festival. Previous postHanoi cuisine to make your smile wider at Banh Mi11 Next postIs Social Media killing our 'Social Skills'? It does not have to!